The National Council for Agricultural Education is a partnership that convenes representatives from each of the AERO groups (Agricultural Education Related Organizations) to identify opportunities and resources, provide a forum for thought and direction, and focus on academic and career success for all students. Click hereto read more. We want to say thank you and congratulations to all of our 2018 award winners and members who made our national convention such a success. Award winner press releases and convention photos will be available on the website soon. Thanks again & see you next year in Anaheim, CA! We are now accepting applications for the 2019 NAAE interns. We have positions available in advocacy, communications, and professional development. Follow this link for more information and to apply by December 21st. Presented by Zoetis, the Veterinarians on Call YouTube channel features real-life vets doing a variety of tasks. This week, Dr. Krantz and Dr. Fleming demonstrate the company’s commitment to the well-being of their animals. Click here to watch the video. In the song “Santa Claus is Coming to Town” there is a line that says “He’s making a list and checking it twice.” At this time of year, many folks are making Christmas lists. I often put books on my Christmas list. If I did not already own a signed copy of Tom of Peace Valley, it would be at the top of my list. This is an exciting juvenile novel about vocational agriculture written in 1925 during the early days of agricultural education. Click here to read more. Host a service event during National FFA Week to show your community that FFA members live to serve! Apply for a $400 Day of Service Mini-Grant to help offset costs. Applications are reviewed on a rolling basis on the first of each month. To learn more about the Day of Service Mini-Grant, visit the Living to Serve Grants website at www.ffa.org/livingtoserve/grants. Want to see what other chapters have done? Check out the interactive map at www.ffa.org/livingtoserve to review funded projects. Check out the growing list of benefits that every National FFA Alumni and Supporter receives as part of their membership, just in time for the holiday season. And, don’t forget that the registration and deposit for the first agricultural travel program are due Friday, Feb. 1. The group will be traveling to Germany and The Netherlands July 1-10, 2019! Click Here to see the tentative itinerary and registration form. CASE is excited to announce registration is now open for the CASE Institutes, which will be held this upcoming summer! For more information and to register for a CASE Institute, please click here. 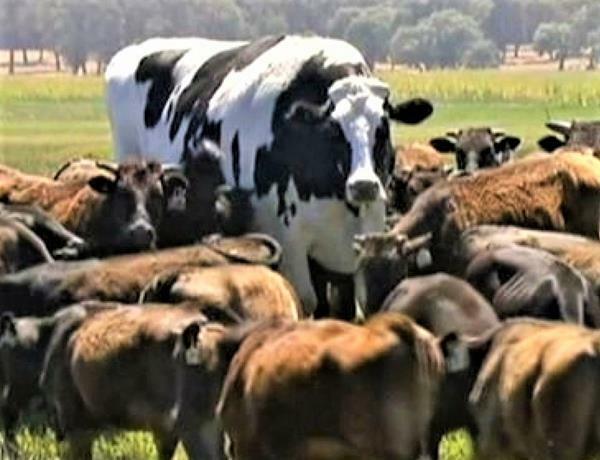 Knickers, the big Aussie steer, escaped the market, went viral, and raised some controversy. Friday, Nov. 30, 2018: A government climate report gets attention, genetic editing on humans raises concerns, university students promote communication, and a giant steer avoids becoming a big beef whopper—these and many more ag/science stories in this week’s edition.